I have always enjoyed being creative. Doing my own thing, recreating an idea I saw, or taking an idea and putting my own spin on it. Awhile back my hubby gave me Joanne Miller's (new at the time) book, "Be Your Finest Art: Awaken Your Creative Self". She co authored it with Dorsey McHugh. You can be creative in anything you do. It is all how you look at it. Before reading it, I didn't see myself as creative. But after reading it and seeing a different perspective on what creative is, I found myself to more creative than I realized it and more recently have found that I thrive on my creativeness. When you think of creative what comes to mind? Being creative can come in any form. Decorating your house...creative. Journaling your thoughts, gratitude, etc...creative. Doodling...creative. Hairstylist...creative. Landscaper....creative. Hopefully you get the picture. If you frame up what you do differently and with a perspective of I am being creative when I (fill in the blank), we are creative in some way. And that is what this books gets at. You can be just as creative as the next person, even when the task you are doing or the job you are doing doesn't seem creative. Laundry seems mundane, but you can take a different perspective and find creativity in it while you fold or put it away. Like I said, I love to be creative. When I was a teacher, the art projects were my favorite time and reading stories. How does reading stories get creative? By adding voices to each of the characters. 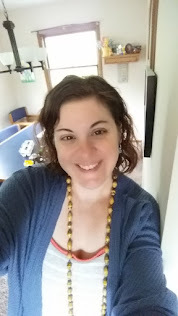 Just sitting down at the end of the day waiting for pick up time, sitting next to the kids in my room creating pictures, seeing them grow and change over the course of the year was a great way to connect while letting the creative side flow. When I had my first son I continued some things from my teaching, but didn't see the creative side in myself as much. I would do monthly hand print and foot print art projects with him. Yup, I started that at about three months old with him. Then when I was reading books to him, I would get creative with different voices. Today...he loves books and loves art. His creative side is translating into legos and play as well. My youngest is getting into art type projects, but not as much as my oldest. He loves books as well, but his creative side comes out more in play and imagination. But really, creative can come in many forms and ways. Part of the reason for choosing the home school route was because of how creative my oldest is. Not only is he creative in his play, imagination, art, but also in his questions. His mind is constantly going, constantly creating. So by homeschooling, we can allow that to grow, not get squashed or diminished. We all had the creative side in us, but as we got older, for most that got pushed away. Over the past 6 years, I have been bringing back my creative side and creative perspective. I picked back up the "Be Your Finest Art" and am re-reading it. I have added in space on planner for the week for creative time, which also includes writing more. 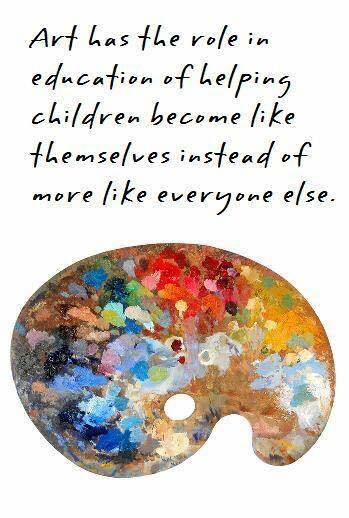 Letting your kids be creative opens them up. It allows them to be themselves, be free, follow their natural flow and rhythm. We are leaving space for creative sides, creativeness to flow each day. It may show up as an art project, or it may be through play, or through some way I never thought of. But here's the thing. That creativeness can be carried over in all areas, even the ones that you may not think of. 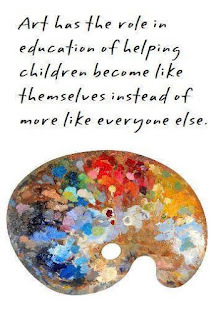 And even if you are an adult, you can still bring back that creative side. Because just like with kids, it allows you to be you, to be free, to follow your natural rhythm and flow. How do you see yourself as creative? What job or task do you do that you can add a creative perspective to it? If you have kids, how can you let them be creative and keep that flowing as the grow? Like in the book it says "everyone is creative, though not everyone is an artist." When you and your kids engage your right brain, it enables an improvement on physical and emotional health, creates stronger relations, all while opening new pathways of learning. Art comes in many forms. Play, arrange flowers, serve meals in colorful dishes, teach with pizzazz (we are all teachers no matter what age we are or what profession we are in), see where your imagination takes you. Rediscover the joy of childhood, relearn to play, reclaim your authenticity. And let your kids do the same.